Are you a restaurant owner and ever wondered if you are losing money on your HVAC systems? Chances are, the answer is yes. Luckily, there are fairly easy projects that you can undergo to save money and energy. A great first step is to consider is to consider a smart thermostat for your restaurant, as maximizing the efficiency of your existing equipment is where it all begins. Air balancing is also an important step to consider. Verde has partnered with Priority Energy to provide commercial air balancing options for our customers, helping to make sure there is not a vacuum inside the restaurant and that air does not rush in every time a door or drive through window is opened. This service can be a quick return on investment, and provide both energy savings and comfort to the customers and employees. After that, consider these advanced HVAC systems for your location. Cooking food is a must for restaurants, and taking the smoke and heat out of the kitchen is also required for < style="background-color: transparent; letter-spacing: 0.02em;">both comfort, safety, and building codes. However, exhaust fans are traditionally an on/off control, and they run at high speed as long as there is cooking in your building. For many fast food restaurants, that can be 24 hours a day, 7 days a week. Since these fans need to pull all smoke out of the building, they typically pull a ton of conditioned air out of the building as well. What does this mean? As you try to keep your customers cool on a hot summer’s day, your exhaust fans pull a huge amount of that air out of the building and makes your air conditioner work even harder. Fortunately, there are advancements in exhaust fans that allow variable speed fans. These can ramp up or down, based on the actual usage of cooking (instead of constantly running 100%). The differences that can be saved on both electricity and gas energy can be significant, although they vary based on your geography in the United States. 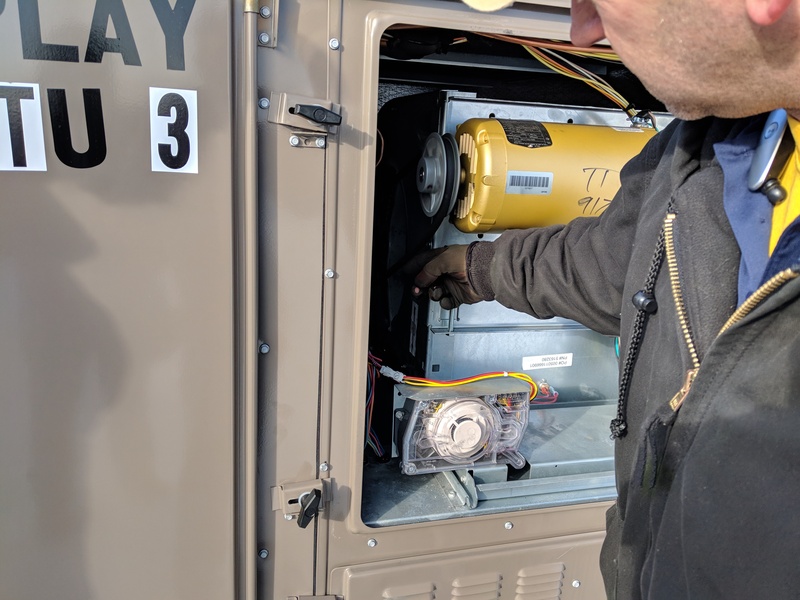 In addition, you can connect this controller to your HVAC system, to communicate to your economizer on your rooftop HVAC units and really balance the in and out of the air in your store. This means, when a customer enters your stores or your drive-through window opens, air will be at balance and a minimum amount of airflow will occur. We have heard countless stories of the drive-through window employee being bundled up in winter coat until the Kitchen DCV (Demand Control Ventilation) gets installed, and then they can comfortably wear just their uniform. Here is a step by step description of what installing a kitchen exhaust Demand Control Ventilation will look like. First – you need to install Direct Drive or variable speed drive motors in your exhaust fans. We typically use Greenheck, although there are a lot of brands of motors available. Next, you need to install a central communication system that can control the fan speed. We use the Franke Variable Ventilation. Many kitchen DCV controls insert a sensor in the cooking hood to know when the fans need to be ramped up, but the Franke HVAC system actually connects directly to the cooking equipment to ramp up and down based on usage. Both accomplish the same goal, but we personally have found the Franke system to have stronger ROIs. 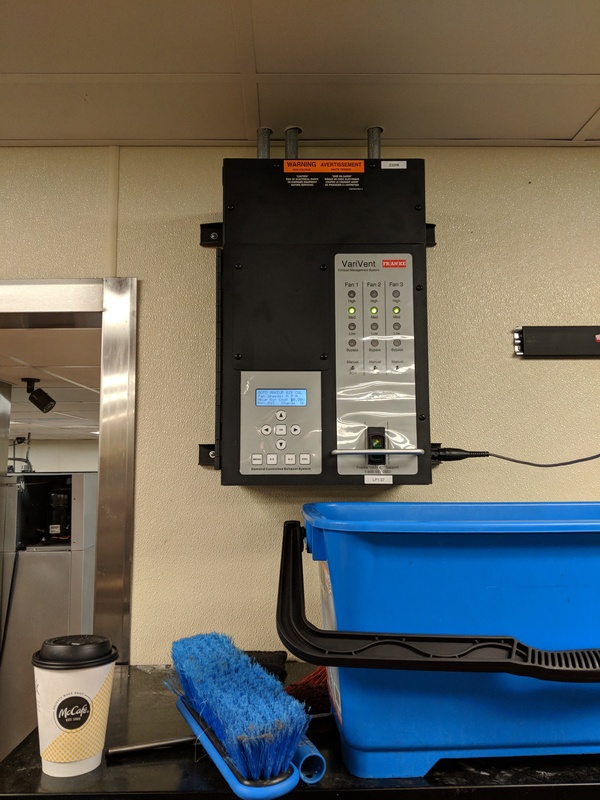 Finally, the Kitchen DCV system needs to be connected to the HVAC supply for the restaurants. This is incredibly important, as balancing the air is where much of the energy savings comes from. Almost as important, if not more, this will create a more comfortable environment for both customers and employees. One of the best parts of installing one of these systems? There are strong energy savings for HVAC upgrades, and therefore, often strong energy efficiency rebates. In fact, in Chicago there are ComEd Rebates that cover as high as 75% of the cost of improvements, depending on your number of exhaust hoods and current equipment. In fact, HVAC improvements are a growing portion of the ComEd Energy Efficiency Program. Do you lack economizers on your RTU – no problem! There are very generous utility rebates for those as well, and often those make sense to be replaced even if they are only 6-10 years old with a CEE Tier 2 level energy efficient RTU with SEERs as high as 16.1. Let us help you find those rebates to make these upgrades today!